Regular readers will know of my admiration for Justin Hill. I’d rate him the best of contemporary writers of historical fiction, so I picked up this Warhammer 40k novel with a huge amount of interest: had the 40k universe found a writer as good as Dan Abnett? Yes. Hill is as good as Abnett. This story bears comparison with Abnett’s second Gaunt’s Ghosts novel, Ghostmaker, where he explores the characters and settings of the Ghosts. Cadia Stands even though it doesn’t. The planet falls to Chaos and Hill follows its fall through the stories of many different companies, many of them fighting doomed rearguard actions that demonstrate that the title is true: Cadia does still stand. It’s a kaleidoscopic literary technique, showcasing Hill’s talent as a writer, and one that mirrors, in the book’s structure, the fall of one of the Imperium’s most important bastions. I look forward very much to Hill’s next foray into the 40k universe. When I read Shieldwall I suspected it. Now, having finished Viking Fire, the second in Justin Hill’s Conquest trilogy, I know it: he’s the best of us. Darn it. In Viking Fire, it’s not just that he reveals a complete mastery of narrative devices (Shieldwall is third person with multiple points of view), for Viking Fire is, mostly, told in the first-person of Harald Hardrada, nor that he tells an extraordinarily rich and involving story (Harald’s life is such that it would require incompetence on the level of genius to make it uninteresting). No, the key facet of Hill’s writing that sets him over and above the usual hack-n-slash merchant of Dark Age historical fiction is his mastery of language. I took four months over the reading of this story not because it was uninvolving and uninteresting, but because I wanted to linger over it. Shieldwall, set in England during the reign of Aethelred the Unready, is written with the beat of Old English poetry running through its rhythms: the lines lengthening and shortening in keeping with the pace of the story, but all held to together by the alliterative beat and the four-stress pattern of Old English verse. Not only that, but the word choice is careful and precise, eschewing later imported loan words for those words in modern English that can be traced back to Old English. So, unlike most historical fiction, the language Hill used in Shieldwall underscores, underlies and deepens the story, rather than being, albeit unconsciously, at odds with it (as often happens with writers less sensitive to these linguistic echoes). Now, with Viking Fire, Hill’s hero is a Viking, a Norwegian, whose life takes him from the fjords of the north, through Rus, to the great city, Constantinople, and the warm sea at the world’s heart. In keeping with the protagonist and the time and places in which he lives, the language Hill uses has changed: the rhythm is different, matching that of the prose sagas that have come down to us from the northlands, and with echoes of the hugely complex, percussive rhythms of the skalds, the court poets and PR men of the Viking kingdoms. But when Harald takes employment under the Emperors and sails, with his crew of Northmen, the Mediterranean, then there enters the story hints of the rhythmic phrasing of Homer and even, in the more languorous passages where these northern warriors settle down under the southern sun with wine and good food and women, something of the ease and flow of Ovid. There’s not many writers who can manage this precision of language, and no one else working in this genre today. Darn it, he really is the best of us. Take a look at this man. Most writers have the sort of face that fits on radio: Justin Hill looks like the sort of fellow you wouldn’t want to see standing opposite you in the enemy shieldwall. Only, judging by the photo, it looks like he’d favour the naked beserker style of fighting! So, you’d listen to what he tells you about good books to read about the Dark Ages. Particularly when he’s written one of the best of them: Shieldwall, about the best evocation of late Anglo-Saxon England I’ve read (the sequel, Viking Fire, has just come out and I’m on it big time). But just to show he’s not all trapezius and deltoid, he also weaves tales around Chinese teashops (The Drink and Dream Teahouse) and memoirs around Eritrean coffeeshops (Ciao Asmara); and, a particular delight to me, writes bolter-blasting stories in the 40th millennium too when there is only war (Storm of Damocles). There you go. Reading that, you’d better order Oswiu: King of Kings. You wouldn’t want to upset Justin, would you? Justin Hill’s read my book! This just gets better and better! 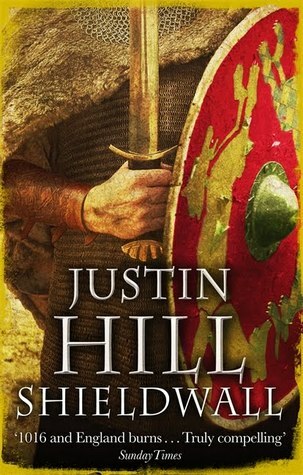 After the wonderful message from Bernard Cornwell on Friday, my editor received an email from Justin Hill, author of Shieldwall (only the best novel about Anglo-Saxon England out there) this morning. He’s read Edwin: High King of Britain as well and he likes it too! I am, I must admit, feeling slightly overwhelmed at the moment, but in a good way! By the way, if you’ve never read Shieldwall, I can’t recommend it enough. Here’s my review of it. Shieldwall is, I think, the best evocation of late Anglo-Saxon England that I’ve read. It’s the turn of the second millennium and England is cursed with probably the worst king it has ever suffered – Ethelred – and also, strangely but equally, the country is cursed with a people that are too faithful to their unworthy king. Despite Ethelred’s cowardice, duplicity and treachery, they stick with him through everything. Hill does a fine job of showing the reader how intertwined the House of Cerdic, the kings of Wessex, had become with the very idea of England, so that, despite Ethelred’s manifest incapacity as king, no one attempted to depose him. The author shows us an England that is still strong in its bones, in the deep layers of its society, but with its sinews wasting away before the depredations of the Danes and the treachery of some of the English nobility. Although at times a difficult read, there is perhaps no more apt Anglo-Saxon era to write of, for their poetry is suffused with regret, with the passing of things and the transience of life, and this is the history of the eventide of a culture and civilisation. The only real drawback to the story is that it is almost too painful to read, but the author draws the reader along with prose that’s muscular and, often, stamped out with the alliterative metre of Anglo-Saxon verse. It might be an easier read for someone unfamiliar with the history of the period, but for me, knowing what was coming next, meant that there were days when I couldn’t bring myself to pick the book up and read further. As the first part of the Conquest trilogy, I suspect things are not going to get better! However, I will wait for volumes two and three with mingled eagerness and trepidation. My only real criticism is that the paperback edition I read had a surprising number of proofreading errors. For the next edition it might be worth going over the text again. Otherwise, an enthralling, if painful, read.